NTS Schedule of Graduate Assessment Test (GAT General) 2019 Online Test Date and Last date of Form submission and Fee and Test Result online GAT-General Graduate Assessment test for Admissions in M.Phil & HEC Scholorship. Admission Open - GAT-General Graduate Assessment Test for Admission to M- Phil & HEC Scholarship. National Testing Service has announced the schedule of Graduate assessment Test GAT General for admission to MPhil and HEC scholarship. 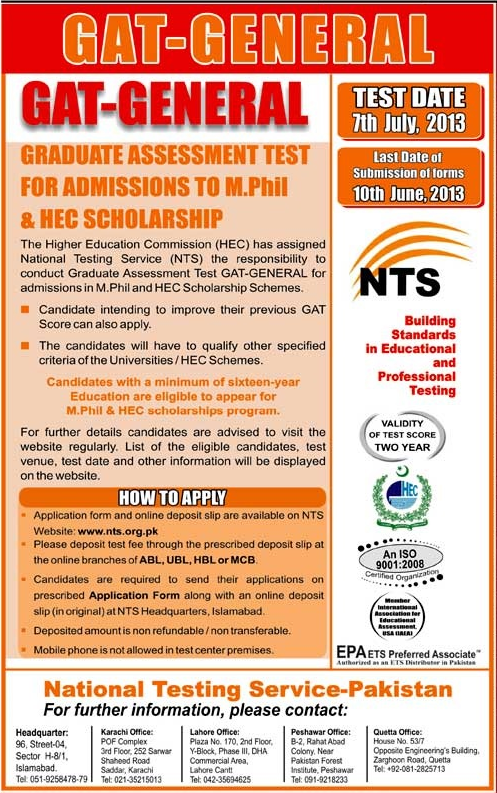 HEC assigned NTS National Testing Service to conduct Graduate Assessment Test GAT-General for admissions in MPhil and HEC Scholarship Scheme. Test Date is 7th July 2013. Last Date of Submission of forms is 10th June 2013. Item Reviewed: NTS GAT-General Graduate Assessment Test Date Result 2019 Form Online 9 out of 10 based on 10 ratings. 9 user reviews.